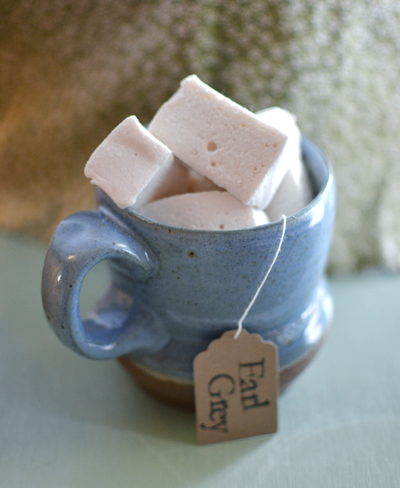 If yesterday’s hard cider marshmallows aren’t exactly your cup of tea, let me…uh…offer you a different cup of tea. Experiment number two in our day of candy making was Earl Grey tea flavored marshmallows. And they are ahmazing. With an H. It’s the same basic Epicurious recipe, but with the addition of double-strength Earl Grey tea in place of all the water. I can think of some possibly delicious ways to make these even more interesting – add a little vanilla extract for something like a London Fog, or some lemon zest for the classic British take on Earl Grey. Spray the bottom and sides of a 9×13 pan with cooking spray or vegetable oil, and dust evenly with powdered sugar. 1/2 c. of the tea into a large bowl, and evenly sprinkle all the gelatin over it to soften. Meanwhile, mix the remaining 1/2 cup of tea with the sugar, corn syrup, and salt. Heat over low, stirring every once in a while, until the sugar is dissolved. Increase the heat to medium/medium high and simmer until the mixture cooks down and the temperature registers at 240 (make very sure that it’s at 240 or even a couple degrees over – not hot enough and you will get weepy marshmallows). Pour the hot syrup over your gelatin/tea mixture, and stir until the gelatin is dissolved. Beat the hot syrup and gelatin on high speed with a hand mixer for about 10 minutes (less if you have a stand mixer), until it is white and thick and has about tripled in size (mine doesn’t always triple, but it should at least increase and look thick and fluffy). In a separate small bowl, whip the egg whites with clean beaters until stiff peaks form. Add the whipped egg whites to the sugar and gelatin mixture and beat on low until it is evenly combined. Pour the mixture into your prepared pan (and don’t worry about completely scraping the bowl clean – getting fingers and extra spoons involved in all this stickiness is asking for disaster), and dust the top evenly with powdered sugar. Refrigerate the marshmallow at least 3 hours, until it has set up and is no longer sticky. When you’re ready, turn the marshmallow out of the pan and cut it into 1″ squares. If you’re having trouble cutting it, you could try moistening the knife blade with a damp paper towel. Roll the marshmallows in a light coating of powdered sugar, and store them in an air-tight container at room temperature or in the fridge for up to a week. Tags: candy, dessert, gluten free, marshmallow, recipe. Bookmark the permalink. Your cup of tea. Dork alert. I love you! Haha.